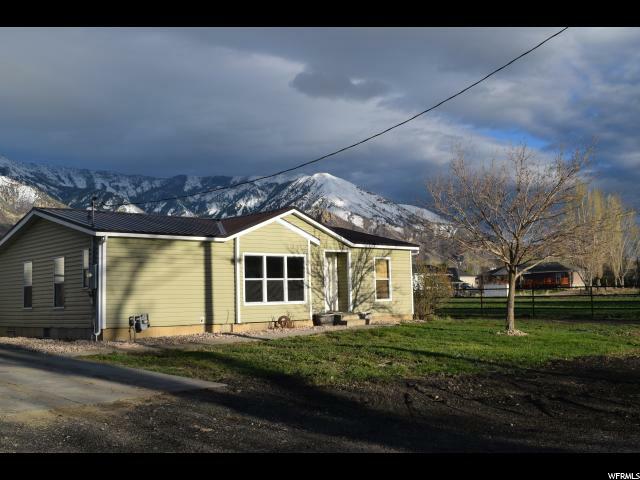 All Mona homes currently listed for sale in Mona as of 04/24/2019 are shown below. You can change the search criteria at any time by pressing the 'Change Search' button below. If you have any questions or you would like more information about any Mona homes for sale or other Mona real estate, please contact us and one of our knowledgeable Mona REALTORS® would be pleased to assist you. 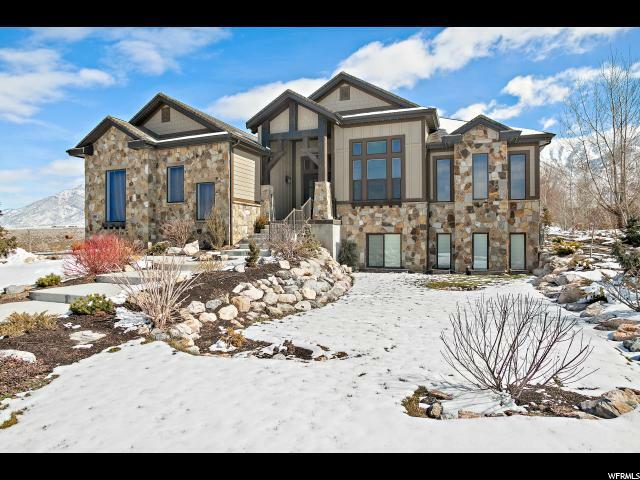 "Custom home builder is selling his remarkable family home with all of the bells, whistles and extras. An entertainer's dream, this exceptional property in Mona will wow you with impeccable design features at every turn. Finished in 2016, this craftsman home is not only beautiful but in immaculate condition. This home boasts an elegant stone entry that flows into an oversized open concept living area through the upscale barn doors. Fantastic natural light fills the main living areas due to the grand windows throughout. Your luxurious Master Suite is right off the flexible office/bedroom with a loft. Don't miss the surprising passage to the Master Suite disguised by a cabinet facade. Relax in your over sized tub ready for you to add either a television or a fireplace.Expansive gourmet kitchen features beautiful flooring, over sized island, granite counter-tops, more than ample LED lit custom cabinetry, trash compactor and stainless steel appliances. Spacious semi-formal dining room flows perfectly into the living area which creates the perfect entertainment area. If your child's wish is a secret dream castle be sure to look behind the dining room table cabinet. There you will find a three-story playhouse fit for any prince or princess. This special wonderland is complete with ladders, beds and media ready perks. Ample laundry area has capacity for two washers and two dryers! The lower level features versatile living in either two basement apartments or massive theater, game room or mother-in-law living space. With full kitchens, the possibilities are endless for either open family living or two separate apartment homes that can be locked off from one another. One of the basement kitchens features a grocery pass through directly from the garage. Storage and project work space is a dream in this home with the over sized three car garage as well as the 33 x 45 insulated workshop, also with a loft space. This shop was designed to house an RV with full sewer and electri"
"Country living with spectacular views of majestic Mt. Nebo. Hard-to-find, spacious horse property and only a 35 minute commute to Provo! 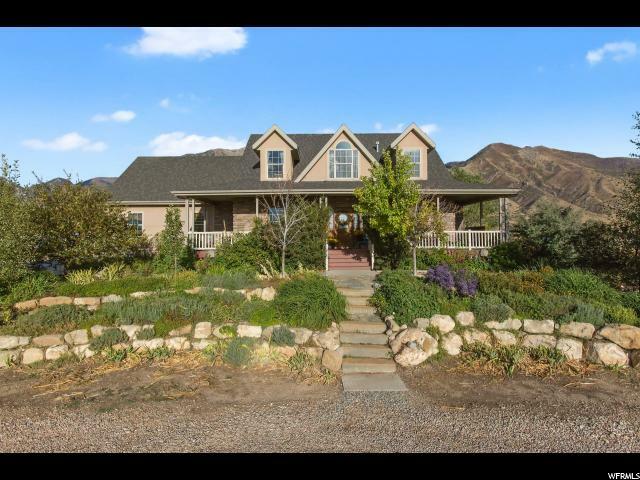 Lovely two story custom home on 1.43 acres of fenced land. The property is completely fenced and cross fenced, with a pasture beyond the backyard. Main-floor living with a master bed and bath and laundry room on the main floor. Heated 2 car garage and a detached, heated 24'x30' shop with 240v service. Highly efficient geothermal heating and cooling system. Square footage figures are provided as a courtesy estimate only and were obtained from the county. Buyer is advised to obtain an independent measurement." "This recently updated and upgraded rambler in a great Mona neighborhood is a must see! Stop by and absorb the unbelievable unobstructed view of Mt Nebo from the shaded back yard. Sitting on 1/2 acre, this 6 bed/3 bath completely finished home has it all. The professional finish work and attention to detail will certainly catch your eye, and many other buyers as well. Come take a look before it's gone!" "Get away from the traffic and noise but only 25 min to Provo. This home has animal rights with 4 stalls, fencing and hay shed all ready to go. Bring the kids, horses, and pets and enjoy this great family friendly home! The yard has 2 apple, 1 plum and 1 cherry tree and some garden boxes built and ready to plant. Your kids will love the large backyard and trees that are perfect for a swing. There is plenty of room for RV or camp trailer parking. The oversized garage with full attic storage makes a great workroom and still room for 2 large cars. The double oven, dishwasher and extra large fridge have all been purchased within the last 4 years, as well as a new furnace and water heater and roof. Sewer line is to the house, just needs to be connected. Septic tank has worked trouble free for 20+ years. " "Price Reduced!!! Nice rambler in an extremely nice Mona neighborhood. Fully finished south facing home. 30 minutes to Provo, gorgeous mountain views and small town feel. Come and see what Mona has to offer. Call/txt today for an appt. " "Horse Property! Beautiful home in Mona with an amazing view of Mt Nebo. Half acre lot. Metal pipe fence around the property with metal pipe fenced corrals as well. New metal roof on the home. New central air unit just installed two weeks ago. Clean and ready to move in. Square footage figures are provided as a courtesy estimate only. Buyer is advised to obtain an independent measurement. This is a must see and will move quick. Don't let this home pass you by. "